How to connect the polycarbonate sheets? Cellular polycarbonate - light and flexible material, allowing to realize the most daring fantasies of the builders. With its leaves to work easily enough, therefore, to handle the Assembly of such structures can anyone. When calculating the amount of material, plan the layout of internal stiffeners parallel to the truss system and an arched design on the arc. Mounting of cellular polycarbonate with the help of specially designed profiles easier and faster, and the design is more aesthetic. Purchase the required number of special joints and end sections. For the construction of ridge designs purchase special corner details. If desired, you can reduce the financial cost by using other suitable connecting elements. For example, for replacing the specialized socket and the connection, get the profiles for plastic wall panels. They fit perfectly in size to the sheets of polycarbonate, and are much cheaper than specialized profile. Your task is to select the most suitable color and width items. Choose only those profiles that will provide the joints strong enough seal. Determine the front and back sides of the sheet of polycarbonateand added to the protective film. On the tape from the front side of the information label of the manufacturer. The back side is usually clean. Sheet polycarbonateand install right side out, which is necessary for protection from UV radiation and preserve the strength of the sheet. Film keep up to the end of the installation. The ends of the polycarbonatetion of the plate free from the protective film just before going to have to tape it with aluminum tape from the top side. The lower end of the seal with the perforated tape. This is necessary to prevent the cell from dust and moisture. In that case, if the installation of polycarbonateand is produced in hot weather, to the docking plate parts place close. The gap appears due to the lower air temperature and provide a flow of condensate. Mounting sheets in frosty weather, make the gaps wider than normal. Support structure color white for protection against the local effects of sunlight. In places of contact of polycarbonateand with wood or metal, install the rubber gasket thickness of 3-4 mm. Attach the polycarbonatesheets to the main frame structure by screws, supplied practical, and do not use nails and rivets. Use for drilling with standard metal drill bits from a number of acute. 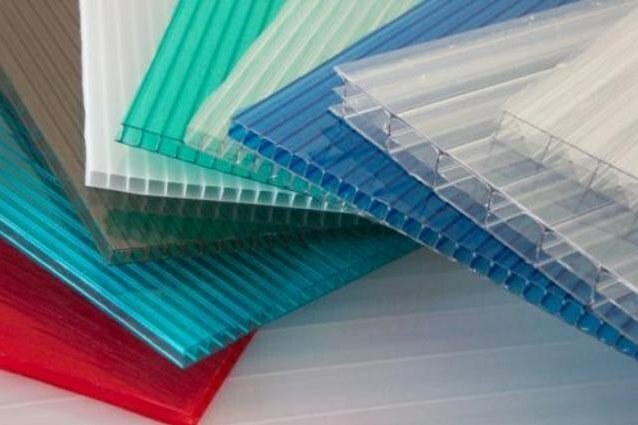 Consider the features of cellular polycarbonate. He is characterized by thermal expansion, so be sure to leave gaps in the joint areas of the sheets between itself and other surfaces - this will prevent plate from deformation. Install the lower end of the t - or u-shaped profile. When using a u-shaped profile, drill a few holes with a pitch of 40-60 cm to ensure flow of condensate. Rassverlivajut holes with a diameter of 2-4 mm larger than the diameter of the screws. Observe the distance between the screws 300-500 mm at plate thickness 8 to 10 mm, and from 600 to 800 mm with a thickness of 16 mm. Given that the fixture must take place exclusively through the air channel plates, start from the edge of the polycarbonatesheet tion of 35-40 mm. Tighten the screws so as not to create a deflection plate. After installation, remove the protective film, because she is glued to the sheet and remove it to become difficult.